Healthy Habits Make for a Happy Garden, Too! Doing the emotional work to get past body image and disordered eating can feel very difficult, but it is so very worth it. Now that I am no longer focused on changing my body, I have a lot of brainpower and energy available for other areas. At first, that was scary, because I didn’t know how I wanted to focus it. Right now, I’m really loving focusing that energy into my urban garden. I love both watching my garden grow, and knowing that my more peaceful mindset is what is allowing me to be successful with it this year. A bit of gardening history: I spent a couple years during my 20s working and volunteering on diversified organic vegetable and fruit farms. So when I first attempted a garden, I would say I had an above-average knowledge of the needs of vegetable plants. My first garden, I started during a time when I didn’t really have time to maintain it. I had a community garden plot, so it wasn’t right near my apartment. I was working a full time job that required a lot of overtime. I had also just gotten engaged, so I was busy planning a wedding. Needless to say, our garden died. That same year, my employer made some beds available for employees to plant in. I planted some melon and squash seeds. I didn’t take care of them. Two gardens dead in one year. Another year, I decided to plant a container garden on the balcony of our apartment. I was super ambitious. I had over 50 types of plants that first year. My husband and I both worked full time and I wasn’t willing to put in the money or brainpower to figure out an irrigation system that worked. Everything died. I resigned myself to not gardening. “I didn’t need to garden,” I told myself. “It’s not cost effective.” I was back to working on a farm by then, albeit in the office, so it’s not like I needed the produce. I had access to fresh food even if I didn’t grow it myself. So, even though I had worked on farms and knew how to care for plants, I killed my first three gardens. I tried to do too much, too soon. I did more than I had the time to maintain. I got frustrated and let things die. A few year later, after I had my son, I learned that there were some community gardens in my city. I got myself on the waiting list for the garden closest to my home. I knew better than to accept a spot in a garden further away. If I had to drive across town with a small child to care for it, it probably wouldn’t get done, despite my best intentions. My previous 3 attempts had shown me that. The waiting list was long. But the following year I received a phone call. They were going to be opening up a new garden, even closer to my house. Would I like a spot? YES I WOULD! At that point, I was working part time (home with my child the rest of the time). I would have more time to garden. It would be a fun thing to do with my kid. We didn’t necessarily need the produce since I still worked on the farm, but I figured it would be fun to do as a family. And that was the first year I harvested any food from my own garden. It wasn’t insanely productive, but we got some good harvests and some good practice under our belts. I learned what I liked growing and what I didn’t care for. 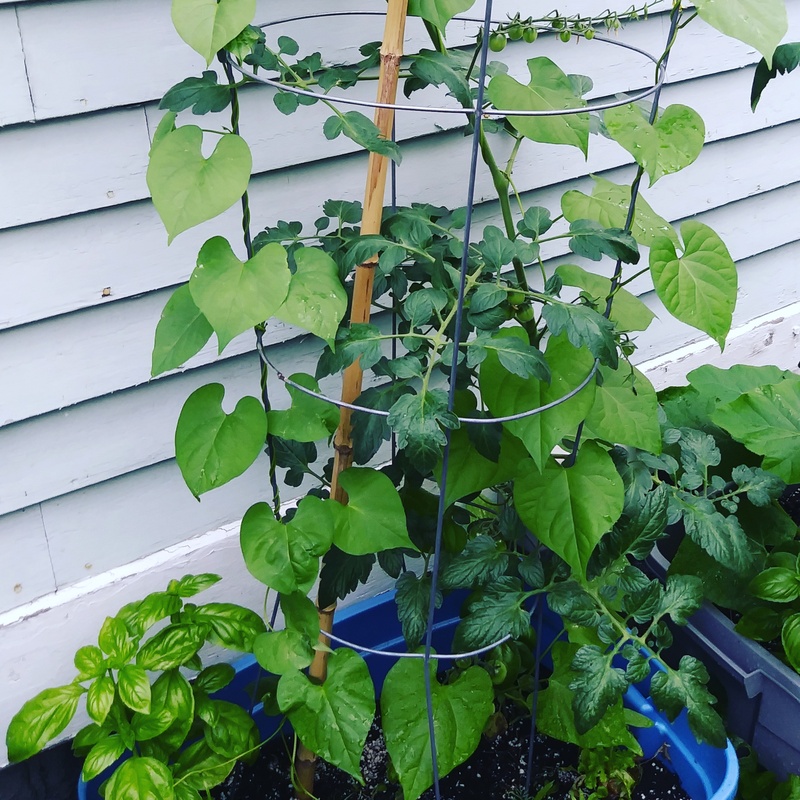 I learned which foods my family really loves growing for ourselves, and made sure we focused on those foods in our second year at the community garden. 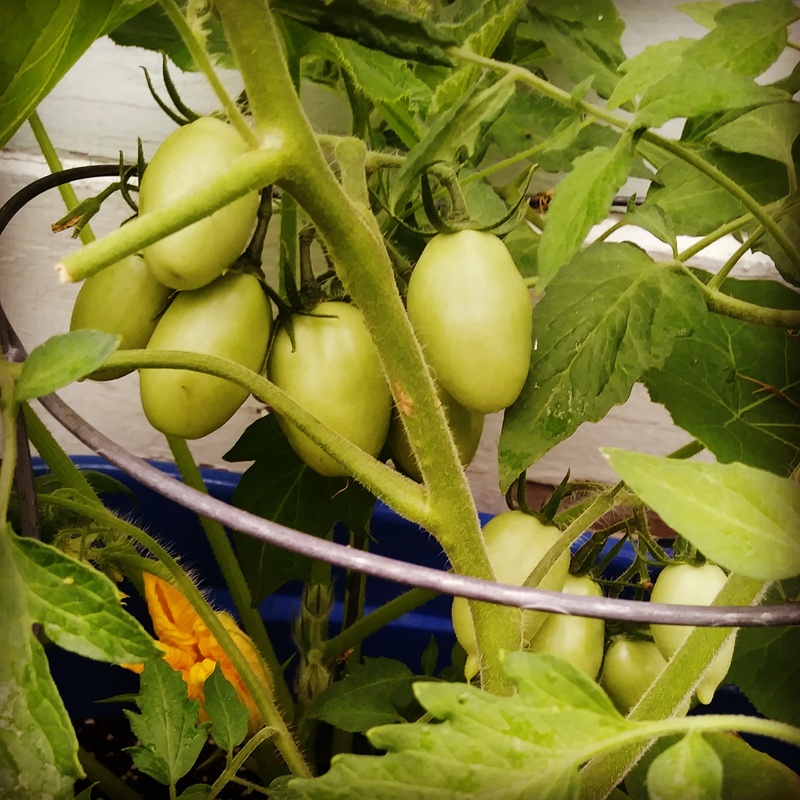 I love growing my own tomatoes and so I made sure to plant many more this year. My husband loves growing eggplant. And my son loves pulling carrots up. This year, we are growing again in the community garden plot, as well as in some containers in our driveway. Methods that make the most sense for production scale farms are not necessarily sensible, efficient, or cost effective for small scale gardens. 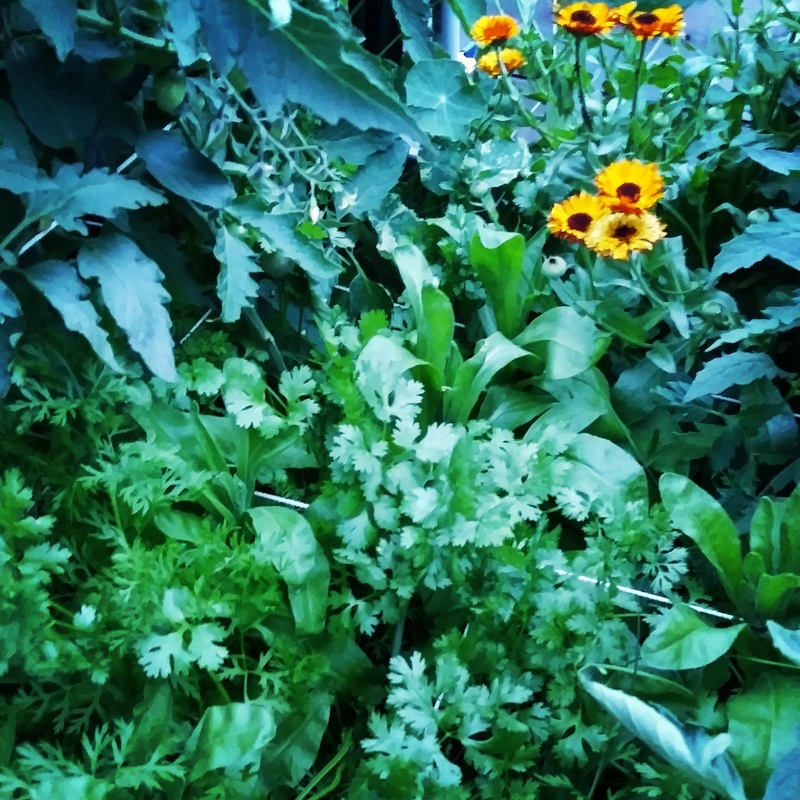 Instead of planting in rows, I needed to learn new methods like square foot gardening, intensive planting, and companion planting to make the most productive use of a small space. The biggest mindset change I had was about weighing and measuring my harvest and doing cost analysis. On a farm where you intend to sell what you grow, you do all those things because you need the business to be successful. In a home garden, you can afford to blow some money and chalk it up to hobbies and entertainment. That was a huge mindset shift for me. I stopped tracking the weights and values of my harvests. I started noticing more how much I enjoy the process. I stopped worrying about whether I was saving money by gardening and started viewing it as okay to spend money on myself in that way. Some people spend money on mani-pedis or beer or yoga classes or live music. I spend money on my tomatoes. It’s okay. I spend time in nature. It gets me outside during a season when I usually hate being outside. Many days of the week I get to eat something I grow. More importantly, I am practicing the skills necessary to grow my own produce, and I am passing those skills on to my child at a young age. I can’t expect to be super efficient at it from the get-go…and that is okay and normal and to be expected! According to the United Nations Food and Agriculture Organization, we’re going to need to increase global food production by 70 percent over the next 40 years to keep pace with population growth. So that means either agriculture will catch up, or the price of fresh produce will go up. If I have the skills to grow my own and I enjoy doing it, it will only serve us well. So I am more than happy to spend money on the education piece while I get some practice. Also, community helps! This year is my second year in the community garden, so I am getting to know some of the other gardeners more. I also started a Facebook group for my friends who love to garden, and started following other gardeners in Instagram. I know this helps my garden. I learn a lot by seeing how others grow and what I can apply to my own space. Seeing others grow motivates me to continue even when the daily work of watering feels tedious.